For 2013, we are hoping to be vegetarian two days a week. This means, that I need to introduce new vegetables into our meals. This week was eggplant. I used the long Chinese eggplant for this recipe. I found these eggplant chips so delicious. It was easy to make, but you just have to watch them to ensure that they do not burn. The next day, I broiled the remaining few chips in the toaster oven to heat them up, and they crisped up even further. To spice these chips up, you could sprinkle some chili powder on them as well baking. 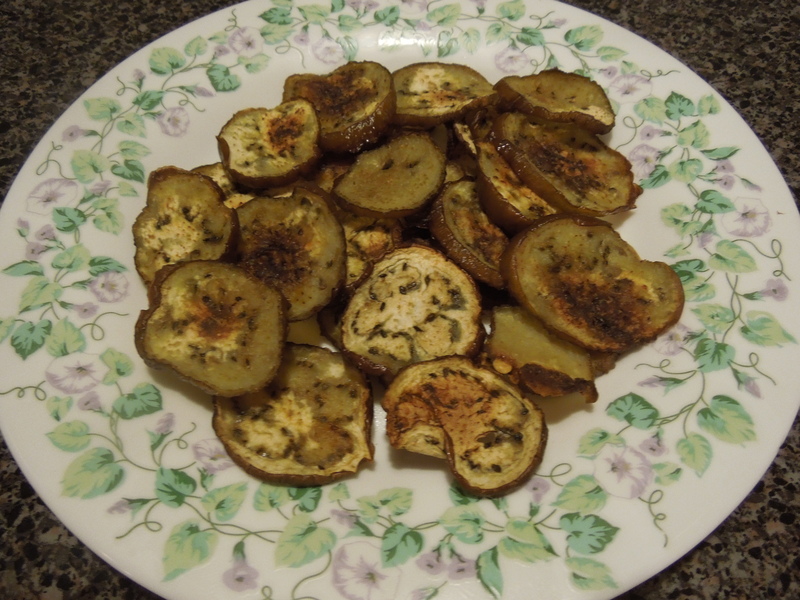 These eggplant chips go well served with rice and other cooked vegetables. It also makes an excellent appetizer. 1. Line a baking sheet with foil. Coat generously with vegetable oil. 2. Arrange sliced eggplant on the tray and then turn them over, so both sides are coated with the vegetable oil. 3. Sprinkle garlic salt and a dash of sea salt. 4. Bake at 400 F for about 12 minutes on each side. This will of course depend on how crispy you want them and how thickly they were sliced.